Another bioprinting pioneer is Organovo. This company was set up by a research group lead by Professor Gabor Forgacs from the University of Missouri, and in March 2008 managed to bioprint functional blood vessels and cardiac tissue using cells obtained from a chicken. Their work relied on a prototype bioprinter with three print heads. The first two of these output cardiac and endothelial cells, while the third dispensed a collagen scaffold -- now termed 'bio-paper' -- to support the cells during printing. 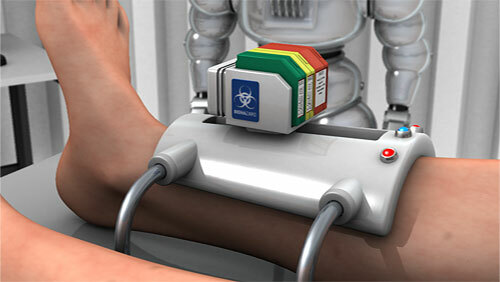 Organovo anticipates that its first artificial human organ will be a kidney. This is because, in functional terms, kidneys are one of the more straight-forward parts of the body. The first bioprinted kidney may in fact not even need to look just like its natural counterpart or duplicate all of its features. Rather, it will simply have to be capable of cleaning waste products from the blood. You can read more about the work of Organovo and Professor Forgac's in this article from Nature. A further research team with the long-term goal of producing human organs-on-demand has created the Envisiontec Bioplotter. Like Organovo's NovoGen MMX, this outputs bio-ink 'tissue spheroids' and supportive scaffold materials including fibrin and collagen hydrogels. But in addition, the Envisontech can also print a wider range of biomaterials. These include biodegradable polymers and ceramics that may be used to support and help form artificial organs, and which may even be used as bioprinting substitutes for bone. Talking of bone, a team lead by Jeremy Mao at the Tissue Engineering and Regenerative Medicine Lab at Columbia University is working on the application of bioprinting in dental and bone repairs. Already, a bioprinted, mesh-like 3D scaffold in the shape of an incisor has been implanted into the jaw bone of a rat. This featured tiny, interconnecting microchannels that contained 'stem cell-recruiting substances'. In just nine weeks after implantation, these triggered the growth of fresh periodontal ligaments and newly formed alveolar bone. In time, this research may enable people to be fitted with living, bioprinted teeth, or else scaffolds that will cause the body to grow new teeth all by itself. You can read more about this development in this article from The Engineer. In another experient, Mao's team implanted bioprinted scaffolds in the place of the hip bones of several rabbits. Again these were infused with growth factors. As reported in The Lancet, over a four month period the rabbits all grew new and fully-functional joints around the mesh. Some even began to walk and otherwise place weight on their new joints only a few weeks after surgery. Sometime next decade, human patients may therefore be fitted with bioprinted scaffolds that will trigger the grown of replacement hip and other bones. In a similar development, a team from Washington State University have also recently reported on four years of work using 3D printers to create a bone-like material that may in the future be used to repair injuries to human bones. The aforementioned research progress will in time permit organs to be bioprinted in a lab from a culture of a patient's own cells. Such developments could therefore spark a medical revolution. Nevertheless, others are already trying to go further by developing techniques that will enable cells to be printed directly onto or into the human body in situ. Sometime next decade, doctors may therefore be able to scan wounds and spray on layers of cells to very rapidly heal them. The idea of having the cells of your face slowly burnt away by a laser and reprinted to order may sound like a nightmare that nobody would ever choose to endure. However, as we all know, many people today go under the knife to achieve far less cosmetically. When the technology is available to create them, face printers -- let alone printers capable of printing new muscles without the hassle of exercise -- are therefore very likely to find a market. (Again note that you can access larger versions of the above images on the Future Visions page and see the face printer working in my bioprinting video. 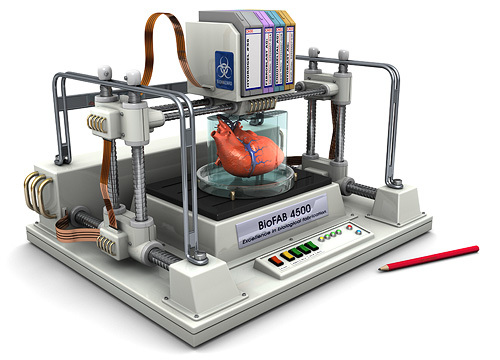 As bioprinters enter medical application, so replacement organs will be output to individual patient specification. As every item printed will be created from a culture of a patient's own cells, the risk of transplant organ rejection should be very low indeed. More information on bioprinting can be found in my books 3D Printing: Third Edition and The Next Big Thing. 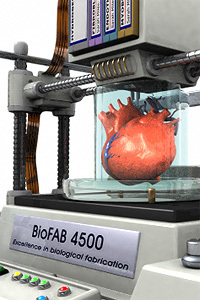 There is also a bioprinting section in my 3D Printing Directory. Oh, and there is also a great infographic about bioprinting here. Enjoy! Return to 3D Printing Resources. Sometime next decade replacement human organs may be bioprinted to patient specification using technology derrived from today's inkjet printers. Find out even more about bioprinting and future microfabrication in "The Next Big Thing".